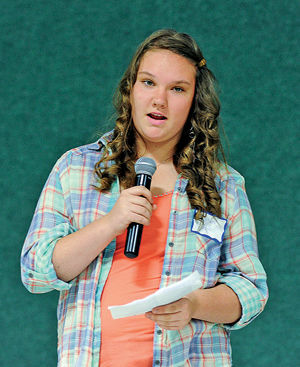 13 year old Meghan Lytle of Washington Township and student at Malow Junior High School from Cadette Troop #70047 in Shelby Township speaking to elementary school students about her community service project. SHELBY TOWNSHIP — Friends of Foster Kids, a Shelby-based nonprofit group, works year-round to provide items to foster children in southeast Michigan. Since December, four local Cadette Girl Scouts endeavored to create a race and family fun day at River Bends Park May 3 to benefit the Friends of Foster Kids. The Scouts started the initiative to earn the Silver Award, the second-highest award in Girl Scouts. Meghan Lytle, Emma Kohler-Lewis, Allison Creek and Kayla Colussi put in more than 200 hours to plan and organize the event. The 5k run/walk will take place at 8 a.m., and the family-fun event will take place from 10 a.m.-1 p.m. and include carnival games, police finger printing, police and fire demonstrations, a princess meet-and-greet, music, face painting, and more. The girls also will be collecting donations of pajamas, socks, underwear, winter clothing, toiletries, twin sheets, blankets, pillows and grants for Friends of Foster Kids. For the past three years, Girl Scouts leader Sue Lytle said she and her troop have wrapped Christmas presents and sponsored foster children through the organization. Toia said her organization assists upwards of 900 children annually who live in temporary homes or foster care after being removed from situations of abuse and neglect. Toia said the organization was born when her daughter, a foster care caseworker, said that her whole caseload of children did not receive Christmas presents for the second year in a row during the recession. Through word of mouth, hundreds of volunteers donated time and items to create specifically tailored Christmas wish lists to more children each year. Now, the organization supplies children with items year-round. With children “aging out” of the foster care system, a large portion of the work the organization does also is directed at supplementing children’s apartments and dorm rooms. For more information about Friends of Foster Kids, visit www.friendsoffosterkids.org or email info@friendsoffosterkids.org. To register for the race, visit www.active.com and search “Friends of Foster Kids 5K Angels Run.” River Bends Park is located at 5700 22 Mile Road. Some might argue that Santa’s workshop isn’t at the North Pole, but rather it’s located off 23 Mile Road in Macomb Township. A small workshop tucked within the former Nachi Machining Building is the temporary home to Friends of Foster Kids, a Macomb County nonprofit whose mission is to provide wrapped Christmas gifts for children in foster care. This isn’t a small operation. Theresa Toia, director of Friends of Foster Kids, said the nonprofit will give presents to approximately 900 foster children and young adults this year. The nonprofit works closely with foster care workers from the Department of Human Services and other agencies, who provide “wish lists” for kids in their care. The lists usually include a child’s name, age, gender, size and a few items the child wants or needs for Christmas. “It’s more than a Christmas gift. It’s knowing that someone cares, that they (foster children) are not alone, and knowing that there are people who will help. These kids have no family; we are their family,” Toia said. Needed items range from winter coats, hats and mittens, to sheets, pillowcases and even things such as new underwear and pillows. Items the children wish for may include anything from a new bicycle to an electronic tablet. A young adult is in foster care until age 21 and wish lists for young people may include new tires, household items and even expensive electronic devices, which one might use to develop skills or even find a job. Friends of Foster Kids accepts donations of new toys, clothes, personal care products and more at its office at Nachi, 17500 23 Mile Road. Drop-off hours are 10 a.m. to 7 p.m. weekdays, and 10 a.m. to 4 p.m. Saturdays. The group also accepts cash from service clubs, businesses and individuals to buy items. Toia and partner Karen Szczotka may ask retailers for discounts, or shop for items year-round to find the best prices. The items are stored, sorted and wrapped at the Friends of Foster Kids office, which moves to a new workshop location every year. Toia started the nonprofit out of her home in 2007 after learning from her daughter, a foster care case worker, that there were a number of foster kids who didn’t receive Christmas presents. Toia teamed with Szczotka and the nonprofit continued to grow until they were unable to operate out of Toia’s home. The duo search for donated warehouse or office space every year to run the nonprofit. It’s in that donated space that the Christmas magic begins for Macomb County foster kids. Numerous new toys, racks of new coats, games, bins of clothes and hat-and-scarf sets, and even a small room of bicycles await preparation. Volunteers – whom Toia calls Christmas angels – spend weeks prior to Christmas going over wish lists, shopping, wrapping and bagging items for case workers, who deliver wrapped gifts to the foster kids. “I am fortunate that I was always able to provide for my son. I feel there are too many kids out there that need things that people can’t afford to buy them. I feel we should help,” said volunteer Sophia Uhlman, who spent an afternoon wrapping gifts. While the nonprofit always welcomes volunteers and donations, the public has the opportunity to help Friends of Foster Kids and have fun. On Dec. 21, Sky Zone, a new indoor trampoline park located at 50810 Sabrina Dr. in Shelby Township, will host a fundraiser for the nonprofit in which they will donate $7 of the $14 they charge for one hour of bounce time. The community is welcome to bounce anytime during the day. Donations of new gifts, cash, wrapping paper, ribbon, boxes and supplies are always needed. For information or to shop for a specific item, call Friends of Foster Kids at 586-307-4483, or visit the website at friendsoffosterkids.org or its Facebook page. Chicks with Sticks members Terry Sands and Vera Lesinski continue their knitting projects for Friends of Foster Kids while surrounded by the efforts of the club for that organization. 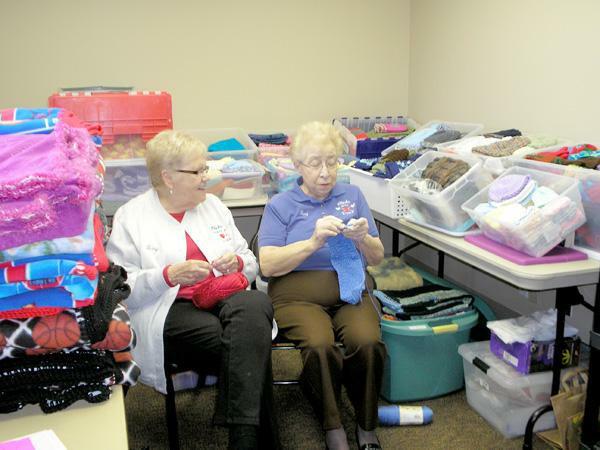 Given the volume of stacked boxes filled with knitted blankets, mittens, scarves and hats stuffed into a room of the Marvin Blank Senior Center in Macomb Township, one might easily assume that the Chicks with Sticks knitting group was preparing for a trip to the North Pole. And they are, sort of. The Chicks have decided to play Santa this year to Friends of Foster Kids, donating the handmade items of its 36 members on Nov. 21. Chicks with Sticks founding member Carol Milkowski said the group decided to donate to a single charity at Christmas in August, when a member brought in a pamphlet from Friends of Foster Kids. Milkowski said that after reviewing the pamphlet, she contacted Friends of Foster Kids founder and director Theresa Toia and invited her to speak before the group. Milkowski said Toia impressed upon the Chicks how badly foster children need the items they can make. “They do not have anything or anyone. So we made more,” Milkowski said. Friends of Foster Kids is a Macomb County-based charity created with the goal of assisting local foster children. Toia said the organization obtains a building with utilities donated from October to January for its efforts. This year the donated building is located on 23 Mile Road in Macomb Township. Toia said last year Friends of Foster Kids assisted approximately 900 children. Foster care case workers provide Friends of Foster Kids with the first names, ages, gender, sizes and wish lists of foster kids they supervise, and donors are asked to provide a child with gifts from the list, according to the Friends of Foster Kids website. Gifts for each child must be wrapped and labeled with the child’s first name, age and the case worker’s code number, according to the website. The gifts are then distributed to the foster care workers, who deliver the gifts. “All of the kids need winter things, scarves and hats. We go by age range to find out where they should go,” Toia said. Toia said she is particularly pleased to be receiving donations from Chicks with Sticks, as the group offers handmade items. “I love when people give me homemade things they make as a hobby,” Toia said. Nancy Nevers, a Macomb Township trustee and president of the Shelby-Macomb Daybreakers Kiwanis Club, said the club does fundraisers throughout the year and selected to donate some funds to Chicks with Sticks to provide yarn and materials for the group’s projects. Milkowski said the Chicks also accept donations from the community. Nevers said that in October, Toia made a presentation to the Kiwanis Club and she discovered that Chicks with Sticks planned on donating a large number of bins filled with knitted items to Friends of Foster Kids. “My Kiwanis group gives them money for the yarn and materials to do these fine acts of charity,” Never said. Milkowski said although there is not an exact count of the items made by the Chicks, the group tried to make things in various sizes to accommodate the Friends of Foster Kids children, who range in age from infants to age 20. “This is our biggest donation ever to just one charity,” Milkowski said. Chicks with Sticks is also planning to donate hygiene products, clothing and toys to Friends of Foster Kids, Milkowski said. Nevers said the Shelby-Macomb Daybreakers Kiwanis Club plans to assist Friends of Foster Kids as a holiday project as well. A group of Santa’s helpers are working to make sure every foster child in Macomb County has a Christmas.